This is a good quality shirt. 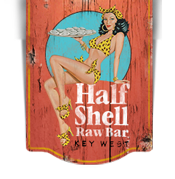 I lived in Key West two + years a few years after you opened I spent much time in your place. I also visited your bar every time i get into the republic. Click the button below to add the Eat It Raw Pocket Tee to your wish list.